The lovely folks at Marvé Juice know I love me some green juices and that it’s a brilliant time of year to do a juice cleanse. So I was so grateful and honored to receive a box of their Cleanse 2 in the mail to try. First and foremost the customer service was lovely and personal. Secondly, ordering the cleanse was easy peasy. Finally, I received it in the most expiditious fashion. I was already impressed before I even cracked open one of their bottles. Light Green: This juice is very simple and had tons of clarity. There was little sweetness because unlike many green juices it had no apple. I found that it kept my blood sugar less wonky because of the apple juice not being in it. Sweet Green: Very similar to the Light Green but with that little bit of apple to sweeten it up. Truth be told this was my most favorite of all the juices and truly inspired me to drink green every day. I even got a juicer because of it. LOVED! Deep Purple: Beets, Kale and Spinach for a rich and heartier juice made me love this one too. The beets gave a bit of sweetness, but also add depth so it was really delish. Intense Yellow: I was a little worried about this juice as it had lemon juice and cayenne, looked intense. But it had just the right amount of maple juice to sweeten it up and make it not too rough on the belly. Personally I could have preferred only one of these, as it was my least favorite of all the cleanse contents, but it was ok. Strength Shot: This little bit of energy in a bottle was super yummy and felt very nourishing. With wheatgrass, pineapple and lemon juice it had just the right amount of tang and sweetness. Comfort Shot: This shot was ok, but again I was not super into the apple cider vinegar as part of my cleanse. It felt a bit harsh and while it tasted ok was not one I’d use again if I did I cleanse. It also has blue agave, cinnamon and apple juice. I loved the green juices, they were terrific and simple. They really inspired me to make green juices an every day thing and actually motivated me to get a juicer for home. The shots were ok, and the Intense Yellow was only so so. I really missed a more nutritive drink added to this cleanse and felt like there were not quite enough substantive calories to last the three days. In the future I would add an almond/date drink at the end of the day to help fill in some of that gap. With such a drink this would be a really terrific cleanse. I liked the simplicity very much. One other note: I LOVED that the juices had expiration dates past the date I planned to cleanse. Often you order a cleanse and you have to drink the juices immediately. By the third or fourth day even with storage in a freezer some juices can get kind of funky. 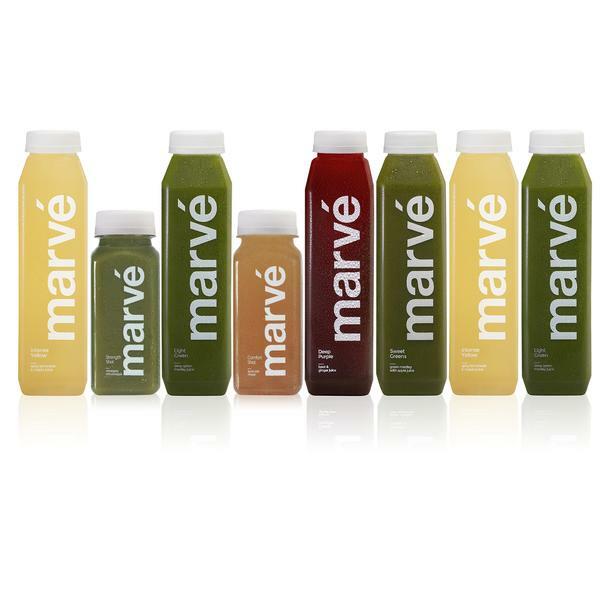 The Marvé juices however were perfect from day one through three. They were super quality and I loved that flexibility in when/how I drank them if I decided a cleanse wasn’t for me. Other juice cleanses I have done needed immediate consumption and that was not always ideal. So bonus on the shelf life of these juices. Marvé Juices are vegan, gluten free, kosher and all that good stuff, plus they are super lovely folks. Bottom line: I would DEFINITELY recommend their juices to anyone, and their cleanses too. I would suggest to someone who needs a little bit more than juice for three days to add something more nutritive in the evenings. But for strict juicers this cleanse is a win.